Property 6: Luxury Yosemite Log Cabin ~ 2 Miles to Yosemite Entrance~ Now Booking!! Property 9: "Yosemite's Suite Retreat" Gingerbread Tiny House Perfect for 2! Property 13: Peaceful Yosemite Pines Retreat, HUGE YARD, POOL, SPA, PLAY AREA and PONIES! Family Memories of "Winter in The Mountains" are created here. Property 14: Family Memories of "Winter in The Mountains" are created here. 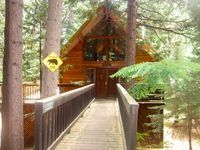 Property 15: Tree Top Cabin - 2 Miles To Yosemite's South Gate! Property 16: YOSEMITE Sugar Pine Cabin, 7 Miles To The South Entrance Of The Park. Property 20: Lauri Lane Mountain House - Your Home Away From Home To Visit Yosemite! Property 29: Stay Inside Yosemite National Park at the Hummingbird Raven House! Property 34: YOSEMITE CABIN IN HISTORIC SUGAR PINE -7 miles to Yosemite So. Entrance HOT TUB! Property 36: Chipmunk Hollow - Get Your Nature On! Property 37: Yosemite Refuge Inside Yosemite National Park - just remodeled!! TWO BEDROOM HOME IN BASS LAKE WITH FANTASTIC FOREST VIEWS! Property 39: TWO BEDROOM HOME IN BASS LAKE WITH FANTASTIC FOREST VIEWS! Property 40: This quaint cottage is the perfect home base for your Yosemite trip. Property 47: 10 miles to Yosemite ~ Milliaty SAVE10% of room rate! Property 49: 'Yosemite's Suite Retreat' Little Bear Tiny House. Studio Perfect For 2!